Working with Larger scale blade: Bullet points and Explanation. Forging a larger blade 14″-30″ can be very frustrating to do because of the time and consistency of the heating required to shape or heat for quenching. This post will address these 2 issues. First take a close look at the two photo’s above. you notice that the brick box is fitted with a drilled copper pipe, this is your air source and will allow you to create enough heat to do your work. I built this forge for the purpose of quenching a 24 inch Seax blade so I drilled the holes very small along to the pipe. This allows me to add just enough heat to get to red without worrying about burning the steel. Adjust the drilled hole size based on what you are doing. 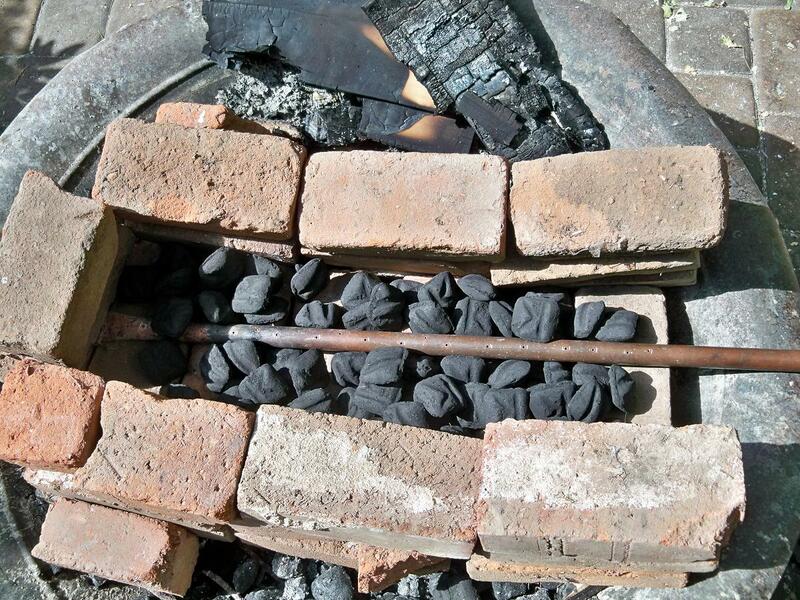 If you are forging then add larger holes for more air. 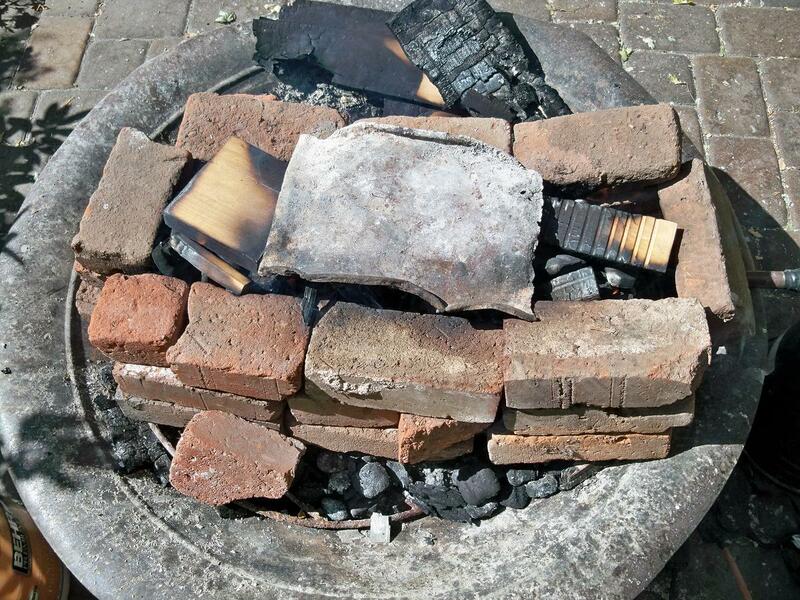 I use old bricks because they retain a great amount of heat and are easy to get. I use briquettes because they can burn hot enough to melt steel or can be heated and maintained just to heat to red as I have done here. In the fire is briquettes and a mixture of hardwoods and ever green limbs. This setup can be built anywhere and works very well, if you shorten this exact design it makes a perfect small blade forge. Lay your drilled pipe and attach to air supply. Add another layer of coal. Add a layer of wood and light fire. Allow fire to gain strength before turning air supply on. When fire is ready turn on air and allow heat to build in the forge. Heat steel to noticeable red color. 1040 and lower quench in water. 1050 and higher quench in oil. Hope this gives an idea of how to tackle larger projects. This entry was posted on September 27, 2011 by .. It was filed under Knife making-Blacksmithing and was tagged with Blacksmith, bush knife, coal forge, iron, iron smith, knife forge, knife maker, Knife making, knife smith, large seax, oil quench, quenching, seax forge, short forge, short sword, smithing, sword forge, viking seax, water quench.